This impressive wine displays very specific aromas of black currant and faded rose. Full-bodied with firm tannins. Subtle hints of toast, jammy fruits and spices. 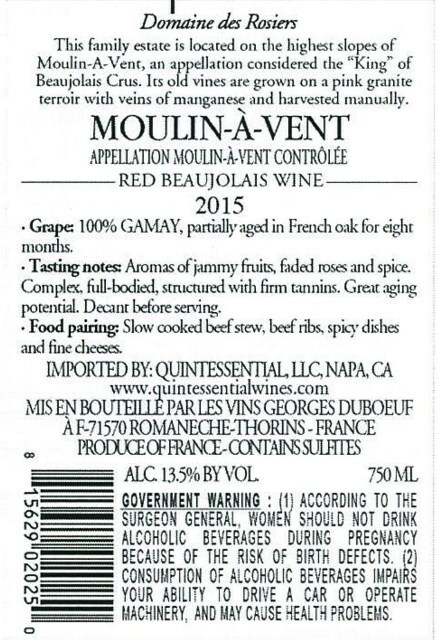 This fine Moulin-A-Vent has great aging potential. Decant. 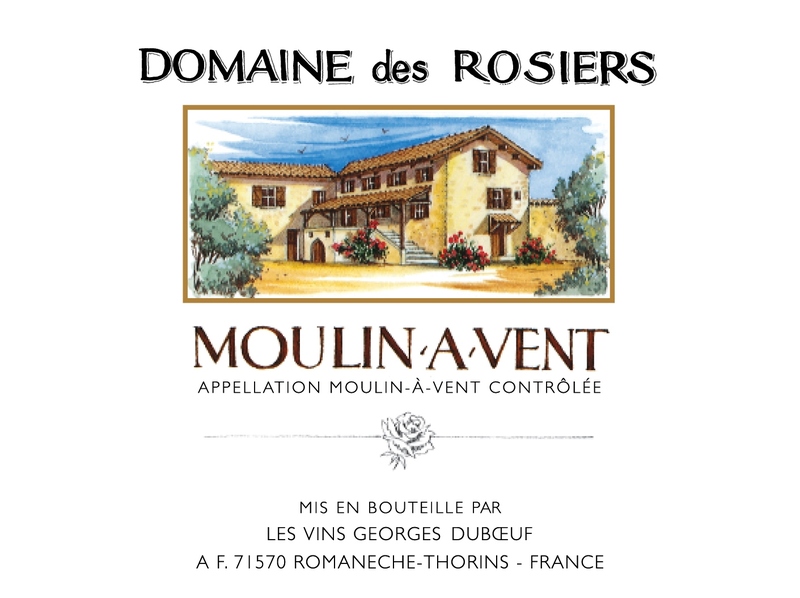 Harvesting of Moulin-A-Vent Domaine des Rosiers is done manually, in whole bunches and the grapes are unstemmed. Maceration lasts between 10 to 14 days and fermentation is conducted at temperatures between 82 to 90 degrees Fahrenheit. It sees 30% oak barrel aging. Gérard Charvet, owner of the "Rosebush" (rosier in French) Estate, exhibits an incurable passion for both his vineyards and his wines. He is, without a doubt, blessed, cultivating the earth of the prestigious Cru, Moulin-À-Vent. His fore-bearers settled in a village of Chenas over a century ago, and it was their work ethic that drove him to become a hardworking, meticulous winemaker. After the death of his father in 1983, Gérard took over the estate with admirable talent. Although investing in modern and efficient winemaking equipment, he never forgot the value of listening to his elders, where the art of vinification was concerned. His excellent wines are frequently awarded prizes in various contests. Combining the respective advantages of stainless steel and oak barrels in aging his wines prior to bottling, he has skillfully harmonized the strengths of both perfect unison. Georges Dubeouf has been purchasing Gérard's entire production since 1976.